Painted with two beautiful colours, black and white... They give a beautiful appearance to the White tiger. Also known as bleached tiger is a variant of Bengal Tiger. They own white fur that is due to absence of pigment pheomelanin, neither they are albinos nor are snow tigers, actually it is a rare genetic mutation. They do not exist in forests and woods, they are captively inbred to raise their population. Both the beasts were sleeping when I took this picture and their cub was sleeping in between them. 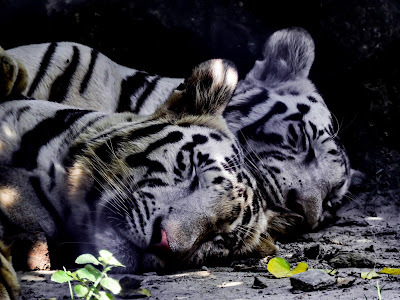 Though Wildlife Photography means capturing photos of wildlife in their natural habitat, but as they are not found in wild this photo was taken in Lucknow zoo, India. The picture has a little different appearance because of presence of cage net between my camera and my subject.